Dr. Willie Parker grew up in the Deep South, lived in a Christian household, and converted to an even more fundamentalist form of Christianity as a young man. But upon reading an interpretation of the Good Samaritan in a sermon by Dr. Martin Luther King, Jr., he realized that in order to be a true Christian, he must show compassion for all women regardless of their needs. In 2009, he stopped practicing obstetrics to focus entirely on providing safe abortions for the women who need help the most—often women in poverty and women of color—and in the hot bed of the pro-choice debate: the South. He soon thereafter traded in his private practice and his penthouse apartment in Hawaii for the life of an itinerant abortion provider, focusing most recently on women in the Deep South. 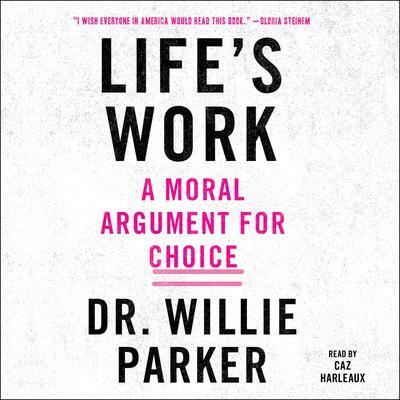 In Life’s Work, Dr. Willie Parker tells a deeply personal and thought-provoking narrative that illuminates the complex societal, political, religious, and personal realities of abortion in the United States from the unique perspective of someone who performs them and defends the right to do so every day. He also looks at how a new wave of anti-abortion activism, aimed at making incremental changes in laws and regulations state by state, are slowly chipping away at the rights of women to control their own lives. In revealing his daily battle against mandatory waiting periods and bogus rules governing the width of hallways, Dr. Parker uncovers the growing number of strings attached to the right to choose and makes a powerful Christian case for championing reproductive rights.